Two goals from Jason Flynn and another from Cathal Mannion were among the highlights as Galway turned on the style to crush Tipperary by 16 points in this afternoon's Allianz HL Division 1 final at the Gaelic Grounds. Micheal Donoghue’s side have had a fierce rivalry with the reigning All-Ireland champions in recent years, and they have clashed in the last two All-Ireland semi-finals, with a point separating them on both occasions. Their last league encounter was a draw, and it was hard-fought opening quarter, until Galway hit their stride and took a 0-11 to 0-5 lead into half-time, thanks to six points from Joe Canning. Flynn scored his and Galway’s first goal just one minute into the second-half and he added the second effort with 13 minutes remaining, before Mannion rammed home a third late on. But if Galway had taken their chances they could have been out of touch at the end of a first-half, where they led by six points. Their forwards were dominant, as they normally are, but this time the backs were brilliant too. Daithi Burke gave an awesome display at full-back, while Aidan Harte was similarly impressive sweeping up loose ball throughout the first-half. Up front Conor Whelan was a constant menace, and Canning converted with ease. Flynn was also winning his personal battle but was guilty of missing a number of scoring opportunities. In all Galway had 11 wides, to Tipperary’s nine, and Micheal Ryan’s men were reeling at the break. It was ferocious from the outset, with huge levels of intensity, and physicality which threatened to boil over at times. Tipperary were in search of their 20th league crown, and first title in nine years, and scored first through a John McGrath free in the third minute. 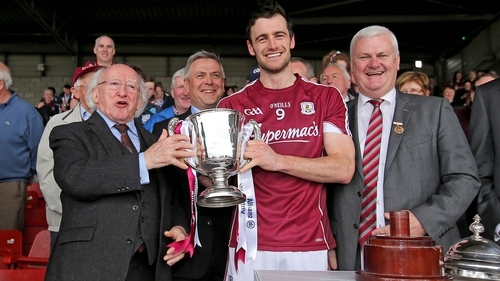 But Galway equalised through Harte, before Whelan opened his tally. John McGrath scored his second free in the sixth minute, but then he missed a free and a 65 as Galway got on top. Noel McGrath levelled things briefly but Galway hit three in a row, with Canning’s second point in the 23rd minute giving them a 0-06 to 0-03 lead. Brendan Maher scored Tipperary’s first point in eight minutes before Galway assumed control again – they hit four in a row, with three from Canning to move six clear. Ronan Maher slotted another important free, to keep Tipperary in touch, but Canning scored his sixth of the half just before the break and Galway led 0-11 to 0-05. Flynn made amends on the resumption, and his speed created an opening that he exploited to blast to the roof of Darren Gleeson’s net in the 36th minute. The teams traded scores after that, which meant Galway always had a healthy cushion on the score-board, and Canning continued to lead from the front. At the back Daithi Burke was immovable and Flynn’s goal in the 57th minute put the game beyond doubt. The late re-introductions of Johnny Glynn and Cyril Donnellan were another plus, while Cathal Mannion the win with a third goal with three minutes left. Galway: C Callanan; A Touhy, Daithi Burke, P Killeen; P Mannion, G McInerny, A Harte (0-02); J Coen (0-01), David Burke (0-01); J Flynn (2-01), J Canning (0-09, 0-03f, 0-02 65), J Cooney; C Whelan (0-05), C Mannion (1-01), N Burke. Subs used: J Glynn for Canning (62), J Hanbury for Daithi Burke (66), C Donnellan for N Burke (68), T Monaghan (0-01) for Flynn (69), S Loftus for Killeen (71). Tipperary: D Gleeson; C Barrett, J Barry, M Cahill; S Kennedy, R Maher (0-02, 0-02f), Padraic Maher; B Maher (0-01), J Forde; D McCormack, M Breen (0-02), S O’Brien; N McGrath (0-02), J O’Dwyer (0-01), J McGrath (0-06, 0-06f). Subs used: N O’Meara for O’Brien (32), Patrick Maher for O’Dwyer (46), T Hamill for Cahill (60), P Flynn for Forde (60), D Quinn for N McGrath (67).